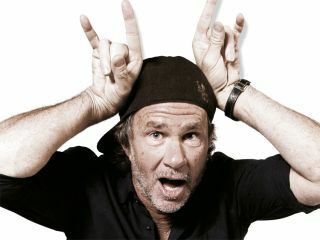 Red Hot Chili Peppers drummer Chad Smith has sustained a "serious injury" while performing with his other band, Chickenfoot, in Paris. "We are sorry to inform our Spanish fans that Chickenfoot cannot perform tomorrow night in Madrid due to a serious injury to drummer Chad Smith. Chad was performing on stage last night in Paris and during the show he hurt his right arm badly. "He has torn his small bicep and cannot play the show Wednesday, 1 Jul. The band is very sorry they cannot play for their Spanish fans this week and plan to return as soon as possible". Doesn't sound too "serious", then? Smith's other-other band - Chad Smith's Bombastic Meatbats - release their debut album Meet The Meatbats on 15 September.